Humans and animals have been in contact with each other for years. Not only have people been using animals as livestock and for transport, but also as companions. Animals play a big part in human lives – it is therefore no surprise that some infectious diseases are able to spread between animals and humans. These diseases are known as zoonotic diseases. Yearly, thousands of people worldwide are infected by diseases spread by animals. A study published in the Journal of the South African Veterinary Association mentioned that at least 63.6% of veterinarians taking part in the poll have suffered from a zoonotic disease, with those involved with farm animals even more likely to contract a disease from an animal. But what about the flu? But can you contract the flu virus from your cat or dog? Cats and dogs can suffer from colds and flu – just like humans; they experience sneezing, fatigue and a discharge from the nose and eyes. According to the Berkeley Wellness Center, you cannot get the flu from your dog or cat. Flu is species-specific thanks to evolution, says Dr Shelley Rankin at the University of Pennsylvania School of Veterinary Medicine. Although it’s unlikely that Fido or Fluffy will you sick, there are however animals that harbour flu strains that can end up making us sick. According to the World Health Organisation (WHO) animal influenza is different from the seasonal influenza humans get so often – the viruses manifesting in your pets won’t transfer to humans in an unmutated form. But occasionally, there are strains of animal viruses that can affect humans through direct or indirect contact. Swine influenza (swine flu) is a respiratory disease in pigs caused by type A influenza virus, which regularly causes outbreaks of influenza in pigs. Influenza viruses have the capability to mutate swiftly, creating new flu strains. 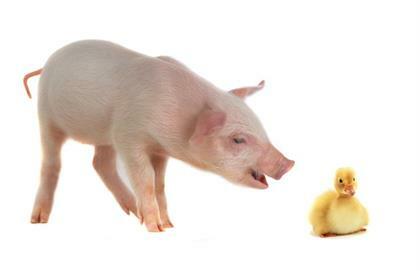 When influenza viruses from different species infect pigs, the viruses start to swap genes, and new viruses that are a mix of swine, human and/or avian influenza viruses can emerge. Over the years, different variations of swine flu viruses have emerged. The WHO states that most swine flu strains rarely affect humans, but in the past decade there were some cases where humans were infected with a strain of swine flu. Avian influenza or bird flu is spread by birds – mostly poultry species such as ducks, geese and chickens. Bird flu is highly contagious and can cause respiratory problems, resulting in death. WHO recorded an outbreak of the H5N1 virus in Hong Kong in 1997, and since since 2003 this avian and other influenza viruses have spread from Asia to Europe and Africa. In 2013, human infections with the influenza A(H7N9) virus were also reported in China. Wash your hands after handling your pets and any of their bodily fluids or secretions. Keep their food bowls and sleeping areas clean. Clean cats' litter boxes regularly and wear plastic gloves when handling stools. Get the yearly flu vaccination to protect you and your family. Keep your immune system strong by eating a balanced diet and getting enough sleep.